This website is one is a series of efforts to bring together a network of those already working on countering the militarisation of youth in their own settings, and to encourage more people to take action on these issues. The first ever international conference on countering the militarisation of youth, held in Darmstadt, Germany in July 2012. The reader for that conference is a great resource. 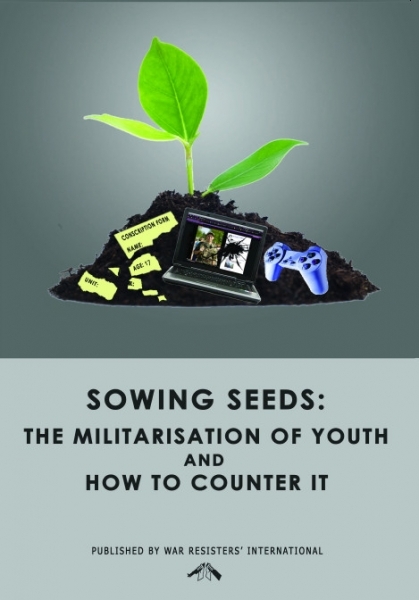 Sowing Seeds: The Militarisation of Youth and How to Counter It: a book, online for free, and to buy online on here. The Spanish and German editions of this book are coming soon!! A mailing group, sharing information on youth militarisation resistance around the world. If you are an activist working on these issues please contact cmoy@wri-irg.org and ask to be added to the list! We'd be delighted if you could use this online space to learn more about how the seeds of war and conflict are sown early in the lives of young people everywhere, and for ideas of how to challenge them. If you have any articles, videos, picture or events you'd like to see published and publicised on this website, please visit http://antimili-youth.net/node/add, or email cmoy@wri-irg.org with the title 'CMOY website submissions'. Most of the content on this site is published elsewhere, but some is commissioned for this website. It is an aim to build a clearer picture, bringing information from across the world into one place, and getting it translated into other languages (mostly between Spanish, German and English), so that information can be shared. More languages will be added as capacity increases. We are aware that this website contains more some content on some regions and issues than others. This partly reflects those already involved in the Countering the Militarisation of Youth network, and partly the language skills of those who have worked on this website thus far. We are particularly glad to receive submissions about countering the militarisation of youth in Asian and African contexts, and those that recognise the gendered dynamics of youth militarisation. Countering the Militarisation of Youth is a project of War Resisters' International. Contact WRI here.